I was in Kenya at the time of Barack Obama’s election to US President back in 2008. Actually, I was in Uganda on the night of his election – in a cheap Kampala hotel room with mosquitos buzzing my face and The World Tonight’s Robin Lustig whispering sweet US political nothings into my ears. Kampala is only a short hop round the northern shore of Lake Victoria from the Obama family’s native Luoland and what, I would imagine, was a hell of a party when he was voted in. Obama, even at the height of his 2008 popularity in the US, has always been more popular abroad than at home. This reached a new level in Kenya, where he is something of a messianic figure. In a country better known for political inertia (it has known just 3 Presidents since independence) or disaster (the last elections in 2007/08 brought severe ethnic violence and rigging), such unambiguous success from one of its sons is not treated lightly. Auma is, however, better equipped to narrate the history the Obama family than her grandmother. Her questioning of family members and friends is meaningful, insistent and serious. This is a micro-social history, something that the old Luo women who sit and cook and gossip in the Obama compound are well familiar with: who married who and how were the children cared for, did the parents approve? A complex genealogy of Kenyan life disrupted by the addition of a white woman in to the family and Barack Senior’s trips to America. Obama Senior’s marriage to Ann Dunham is where the US-focused narrative normally begins. Auma is, however, more interested in the Kenyan side of the family. We are, consequently, introduced to the strict and conservative patriarch – Hussein Obama – who became a cook in a wealthy American household and constructed a well-ordered homelife from which his children could build modern lives in colonial Kenya. Barack Senior is portrayed as an imposing, intelligent figure with a fierce pride in his country, but distant as a father. 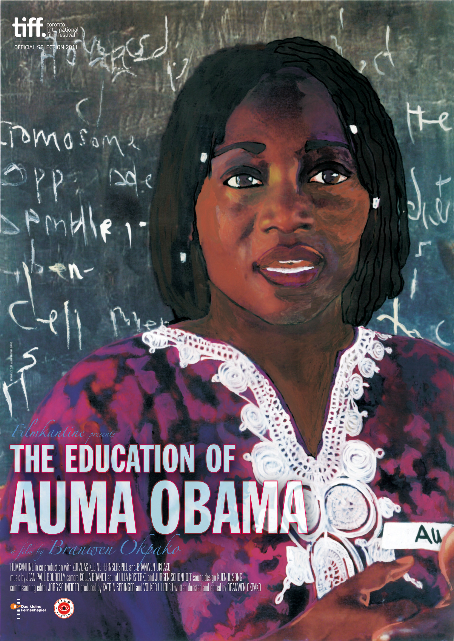 What The Eductaion of Auma Obama conveys well is the cultural millieu inhabited by a generation of young Kenyans who went out in to the world, and were profoundly changed by their experiences. Whilst Barack Senior was studying in the US and building a life with Ann Dunham, he remained married to 2 Kenyan women, including Kezia, now an old lady, who tells us he had fallen in love with her when she was just 14 – quite a contrast to the American social norms Barack would later inhabit. Auma herself left Kenya with great excitement after graduating from secondary school and went on to study in Heidelberg, Germany in the early 1980s. There she found a niche as an African cultural critic whilst completing a PhD in cultural studies. Some of the best moments of the film are the archive footage of her debating with an austere set of German intellectuals the meaning of African culture, purpose of aid or injustices within the world economic system. Barack has commented that Auma had a strong influence on him in rediscovering his Kenyan roots, something he has never been shy in acknowledging as the United States’ first African-American President. However, The President has never entirely convinced that his affection for Kenya is anything other than romantic. In this documentary he remains a peripheral presence, literally just a cardboard cut out which his extended family hold up, dance around and carry over to the graves of his father and grandfather. Auma, however, stares meaningfully in to the middle distance, determined to figure out to where and what she belongs.